I love this granola and my biggest problem is trying to stop myself from eating all of it before transferring it to a storage container! 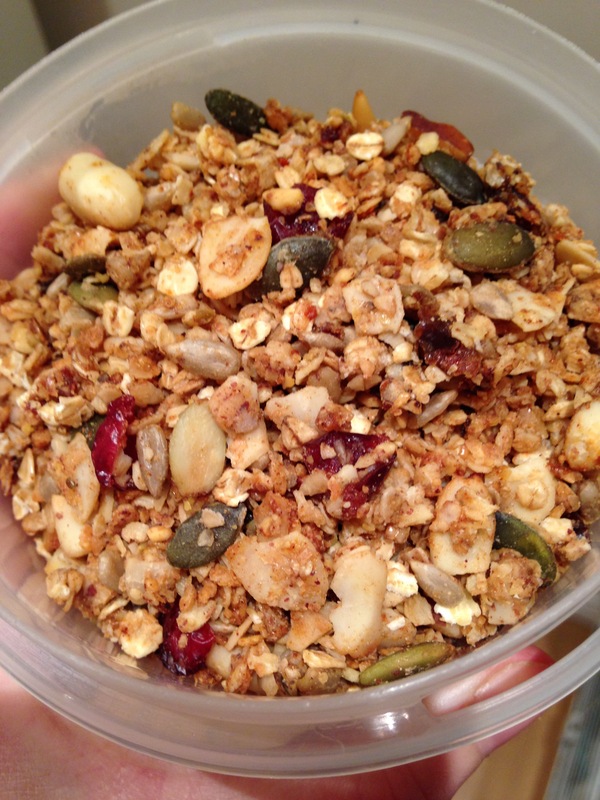 It’s an easy and fairly simple granola that’s luxurious and nutritious. I’m definitely going to make a super big batch of this protein rich, low GI and naturally sweet feast for the morning of my wedding to serve up with a luscious coconut dairy-free yogurt. The slow energy-releasing oats, high-protein and fat-rich nuts, sugar and insulin balancing cinnamon and natural sugars from the dried fruit will give me all I need to fuel me ahead of the big day. 1 cup milled linseed (or flaxseed) – I often use a mix of both with chia seeds. 1. Preheat the oven (I use fan setting) to 150 celsuis (300 fahrenheit). 2. 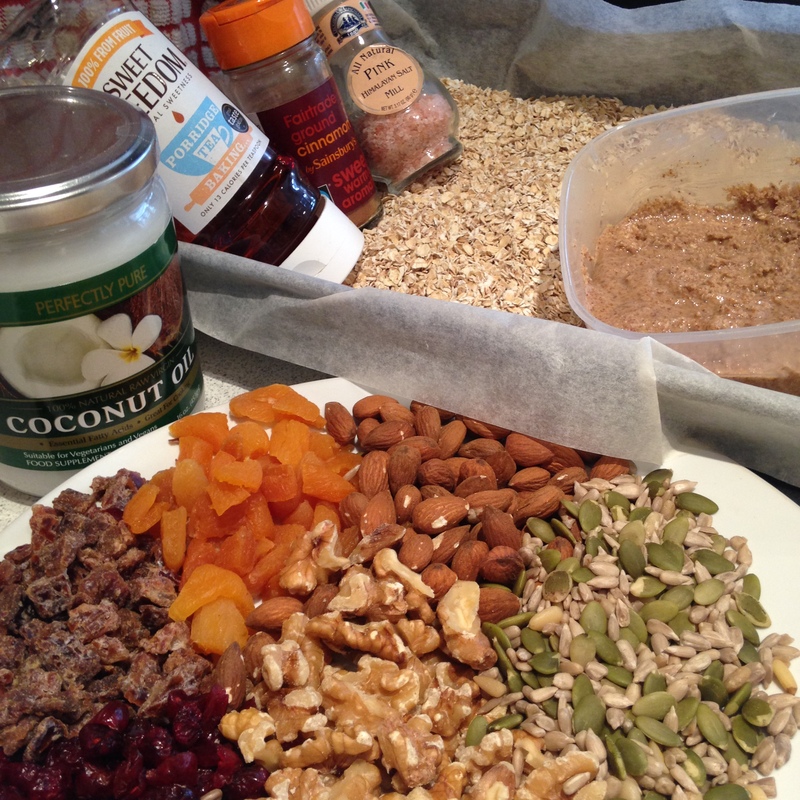 Mix oats, milled seeds, nuts, seeds, salt and cinnamon in a large bowl and mix well. 3. In a saucepan gently melt the coconut oil, almond butter and syrup together. 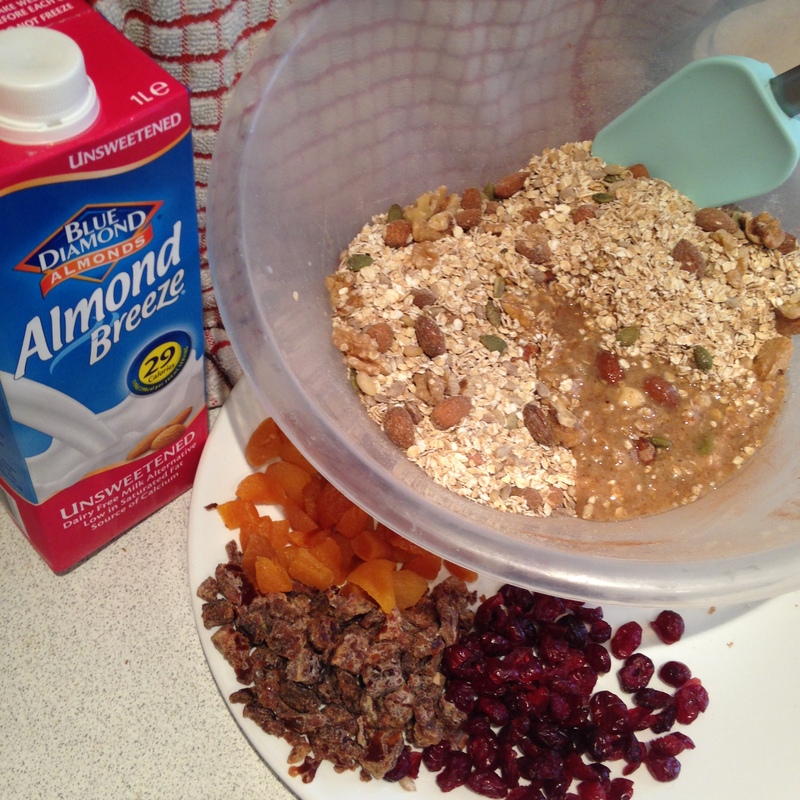 Take off the heat when thoroughly mixed and add almond milk. 4. Add wet mixture to the dry ingredients and mix well. This should resemble a wet sand texture when combined. 5. 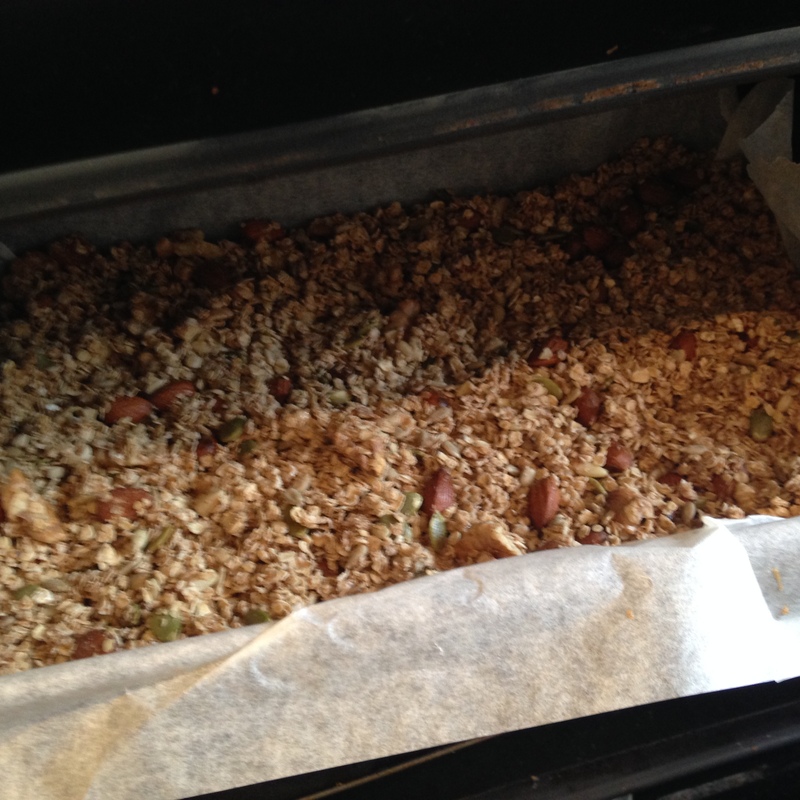 Line a large baking tray with greaseproof/parchment paper. 6. Evenly spread the mixture on the tray and place in the oven for 15-20 minutes. Make sure to turn the mixture over using a spatula or wooden spoon every 5 minutes. This way you ensure an even bake and avoid burning the nuts! 7. When the oats look like they have turned a golden brown and are slightly toasted, add the dried fruit and mix well. Put back into the oven for a further 5 mins. 8. 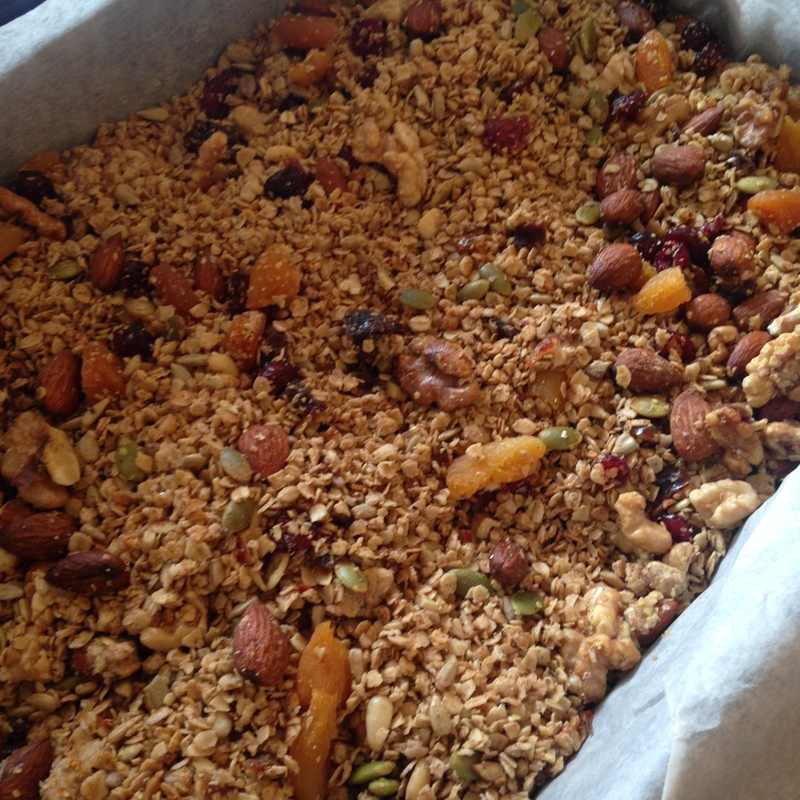 After baking for a total of 20-25 minutes the granola should be ready to take out. Don’t worry if it still appears a little sticky, it just needs time to cool. Leave out for at least 15 mins and stir it around every 5 minutes to help it cool down and dry out evenly. 9. This granola will keep fresh in an airtight container for about a week (if you can hold back on eating it for that long!!). When you fancy a bit I suggest serving it with your favourite milk, yogurt or ice-cream!